Drawings will be held at 2:00pm, 4:00pm, 6:00pm, 8:00pm, and 10:00pm each Friday and Saturday in April. Ten names will be drawn to win an entry into the Qualifying Drawings. Plus, if present, each winner will receive $50 in Diamond Dollars. Earn entries by playing your favorite games with your Diamond Club Card. Saturday, April 27 at 11:00pm, ten names will be chosen from the qualifying winners. Those ten winners will have a chance to choose the lucky key. 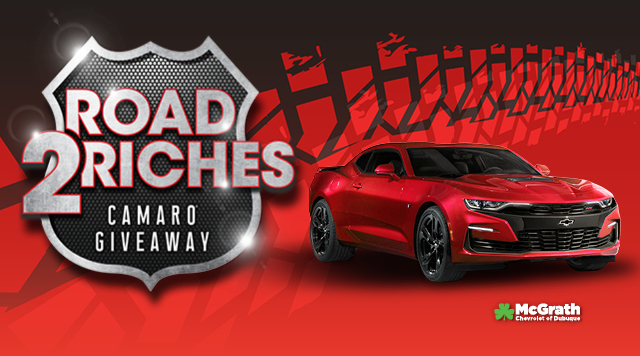 Nine will win $500 in Diamond Dollars and one will win a NEW CHEVY CAMARO®! Grand Prize winner will receive a $30,000 voucher from McGrath Auto, or can choose $20,000 in cash. Model and color may vary. Chevy, Chevrolet and Camaro are registered trademarks of General Motors, LLC. Complete details and official rules available at the Diamond Club. Must be 21 or older. If you or someone you know needs gambling treatment, call 1-800-BETS OFF. Subject to IRGC approval.